Offering a user-friendly, streamlined approach to lone worker solution management. 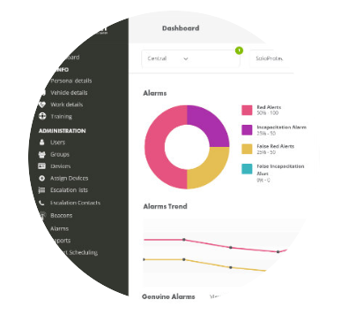 SoloProtect Insights is our online, customer engagement portal giving simple implementation, management and metrics relating to their SoloProtect lone worker solution. Whether it’s adding or editing existing end-users, device or escalation allocation, or accessing the integrated training materials – SoloProtect Insights provides 24/7 access to a wide range of user-friendly features designed to streamline the customer’s user experience. 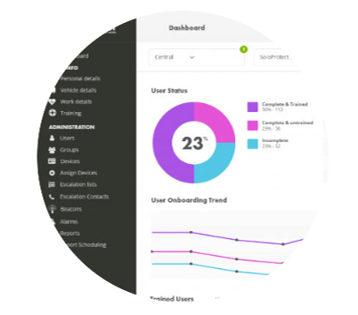 Wizard tooltips, visual indicators, and templates are used throughout the platform supplying users with supportive information needed to ensure they maximise the benefits that Insights offers. Should users be deploying the drag and drop feature, bulk uploading lone workers into groups, or allocating multiple workers to a device, users of the platform are advised and supported through each step. 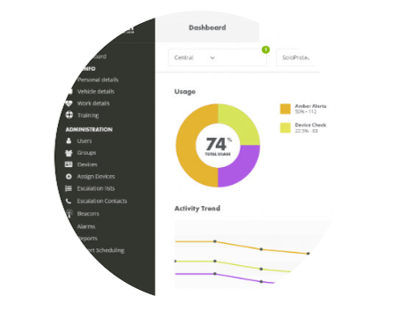 Within SoloProtect Insights, a solution manager can scroll between three dashboards giving useful and digestible information instantly. Helping with day-to-day management of a lone working team, to access data for monthly reporting, or for wider circulation across an organisation supporting return on investment. Solution onboarding is made a less daunting prospect with Insights. Easy set up of personnel, access for individual users to manage their own details, and online training support for users, accessible on PC, mobile device or tablet. Giving a lone worker manager accurate and up to date information on utilisation across their team. Insights also helps address areas of training need, to identify usage patterns that might highlight a particular lone worker risk, and to build reporting to suit the needs of your organisation. 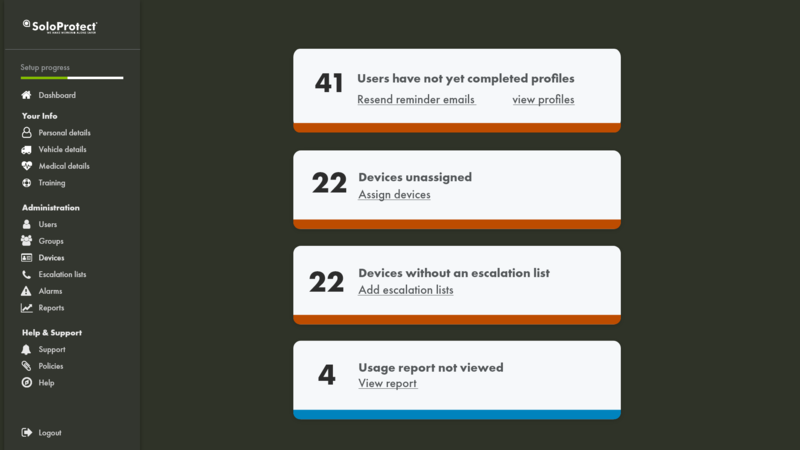 Use Insights to keep in touch with how alarm activity is breaking down across a team. Data showing incidences of genuine Red Alerts, Incapacitation alarms and false activations across the estate of lone worker devices. Through the agnostic design users of SoloProtect Insights can view, update and carry out amendments from their mobile and tablet devices, as well as a laptop or computer. Affording greater flexibility, as users do not have to be in the office or at their desk to make a quick or urgent change. Quick and easy ways to store important user contact information, working patterns or important medical details that may inform how a ‘Red Alert’ is best handled. Changes will then be live within the SoloProtect Alarm Receiving Centre in minutes. A simple drag and drop style interface and the ability to bulk-upload users into groups, making it easier for customers to manage their lone workers and devices. Accessible online training for administrators and end users, including knowledge check elements, supported by full audit trail. Agnostic design, allowing adaptive viewing capabilities for users and managers alike on their mobile devices, tablets, laptops and personal computers. Easy access to a range of reporting, including monthly and weekly activity reports. Secure platform. All requests within the platform use HTTPS using SSL for secure data transfers inline with industry standards. SoloProtect is Cyber Essentials Plus accredited. SoloProtect Insights is available to all SoloProtect Customers. The platform forms a core support tool for all SoloProtect solutions and has been designed to evolve and encompass all existing and future SoloProtect lone worker products. Need Access? If you're a SoloProtect Customer and not currently set-up on SoloProtect Insights, please contact Customer Support, and we'll arrange access for you.